Georgia is a country located in Southwest Asia. It is probably most well known to the western world for being part of the former Soviet Union and was the birth place of Joseph Stalin. 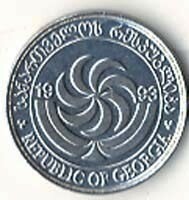 Although Georgia declared it's independence from the Soviet Union in 1991, it was not until 1993 that the country was able to mint it's own currency, the Lari. Lari are divided into 100 Thetri. 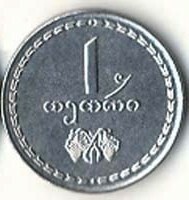 The symbol on the obverse of the thetri coin is called a Borjgali. The spiral represents the sun and beneath it is the tree of life. The borjgali symbolizes past, present and future and has strong meaning in Georgia. 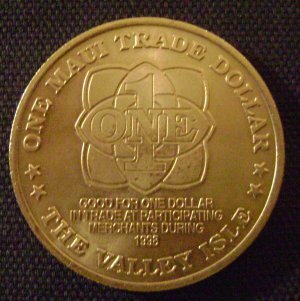 Maui Trade Dollars have been issued annually since 1992. 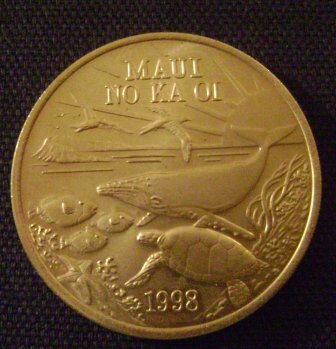 The coins are minted on behalf of Maui's Chamber of Commerce to raise money for charity. Various local businesses in Maui will accept these trade dollars as currency. The phrase "Maui No Ka Oi" means "Maui is the best." Nicholas of Coinbrag.com for President 2008! A news clip of my candidacy for president of the USA. On the main menu to the left is a link Browse Recent Coins. This new feature allows you to browse through all of the coins pictures submitted to CoinBrag.com's database. The order is by most recent pictures submitted. When you submit new pictures they will show up at the beginning of the gallery! I've made 2 significant changes to the price sheets of all the coins in the database. What can this do for me? Well if you are selling a coin you can use our pricing as a reference for those who may not know the value of the coin. Since anyone can insert pricing, you can add your pricing to the coin database on CoinBrag.com and you have a 3rd reference to help sell your coins! Any potential customer can click the link you provide and verify the value of the coin according to our price guide. Your customers will know that any fraudulent values would be removed from the site. It's a win-win situation! The other change to the pricing is the addition of eBay gallery pictures to the bottom of the pricing pages. Based on the coin info of each page, eBay searches their coin section for similar coins. The auctions shown are from sellers anywhere in the world and most likely not Coinbrag.com. If you are an eBay seller and you add a coin into Coinbrag that you happen to have for sale, it's very possible it will show up on Coinbrag's eBay gallery search!